My husband abandoned me for 5 days to attend a conference for work. I managed to keep myself so busy that I barely noticed he was gone (other than to note that it so much easier to make our bed when he is not here. I just flip my side of the covers up and done. When he’s here I pretty much have to start from scratch every morning). I had a great time hanging out with friends and eating lots of yummy food. Thursday night I met up with some friends at WTMD’s First Thursdays in the Park concert. This month featured Deer Tick, Jesse Dee, The Kopecky Family Band, and Brett Dennen. I was mostly interested in seeing The Kopecky Family Band as I saw them at Firefly earlier in the summer and really liked them. As I have mentioned previously, the place where they have these concerts is no longer big enough to hold them and the sound is awful, so it’s not really a pleasant experience. We stuck it out long enough to hear The Kopecky Family Band, but left before Brett Dennen went on. I really hope they’re looking for a bigger space to hold these concerts because it’s just not fun where it is now. After leaving the concert we headed over to The Bun Shop to grab dinner. I’ve been wanting to try it out for awhile now, but haven’t had the chance so I was happy we went. They basically have a variety of what constitutes buns from various cuisines around the world. I ate a chicken pasty and it was delicious. It’s definitely a quick, cheap eat though it’s vibe is like that of an independent coffee house so you can totally stay and hang out even though you receive your food in short order. Friday night I originally thought about going down to DC to celebrate my friend Emma’s birthday, but then thought about getting down there in traffic after I got off work plus the fact that I had been engaged doing stuff and not had a night off in 12 days. I decided it would be better for my sanity to just stay home and take a night off, so that is what I did. I grilled up my dinner, sat outside on our patio and ate my dinner while finishing my book. After dinner I walked around the corner to The Charmery for some ice cream. I tried the thai iced tea flavor this time. It was delicious. Saturday I split my time between two groups of friends. I kind of have 3 groups of friends in Baltimore. Some of them overlap but mostly not much. I have my friends that I met through a social website where we planned social events online and then met up and did them. Incidentally I met my husband through that group of people. I’m not really sure if the site is still around as I haven’t looked at it in years. My second group of friends is composed of librarians in Baltimore, and the third group is my friends from church. 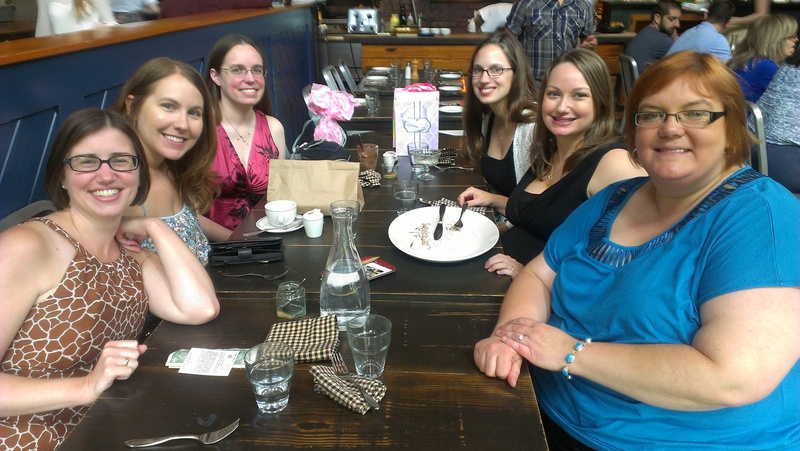 Saturday morning I met up with some of the ladies from the first aforementioned group to celebrate the impending arrival of our friend Katie’s second baby. 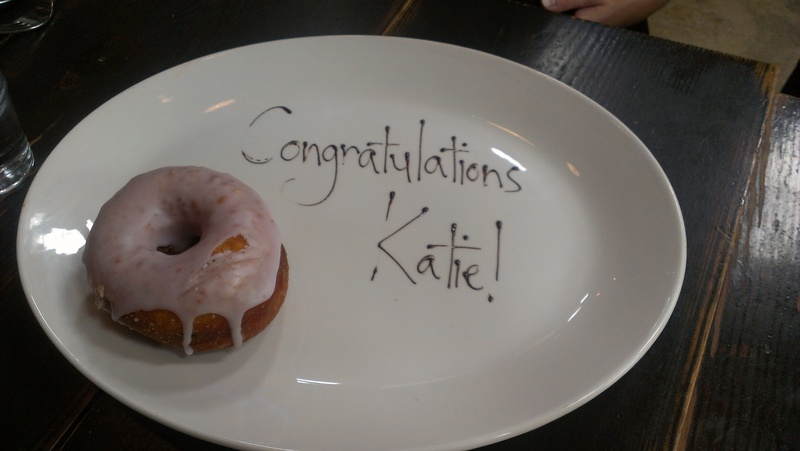 We met up for lunch at Woodberry Kitchen. Needless to say the brunch was delicious. I ate their modified version of chicken and waffles, which was guinea hen and waffles topped with bacon jam. For dessert I had butterscotch pudding. I love butterscotch pudding. It was a great morning with good friends that stretched into the afternoon. Saturday evening I spent with some of my friends from church. I decided to take advantage of the fact that Paul was out of town and had a ladies night at my house. I initially suggested watching a girly movie, but we never got around to that. We enjoyed some pizza, cake, and drinks just sitting around talking, laughing, and having a great time. It was a very fun evening and I’m glad I planned it. Even though Sunday was August 4, I finally got to officially call it summer as I finally ate crabs. 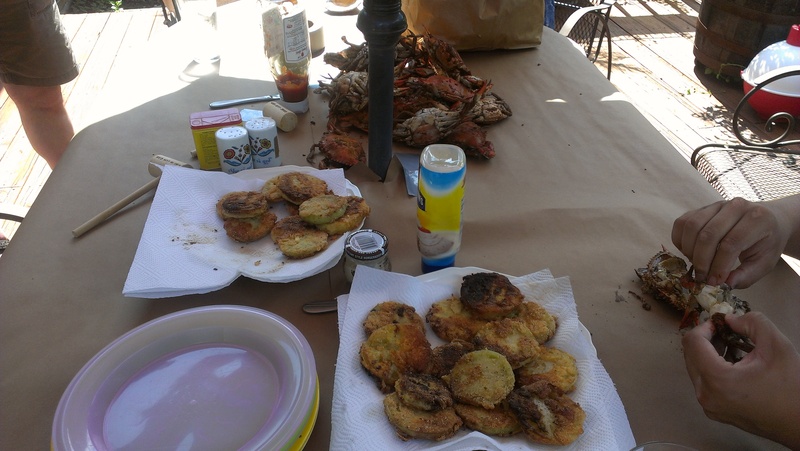 You can’t call it summer in Maryland until you’ve picked crabs. I had mentioned on Facebook before leaving for Rhode Island that I hadn’t had crabs yet this summer and needed to remedy it when I got back. My friends Kevin and Tracie invited some people up to swim in their pool and eat some crabs on their deck, so I headed up their way for the afternoon and hung out with some good friends and cute babies. I didn’t actually make it in the pool. The weather was cooler than I like to swim and the timing with the crabs didn’t seem to work out. I also had a ridiculous amount of green tomatoes from our farm share, so I fried up some fried green tomatoes for everyone to enjoy. We also had some great corn on the cob, and I made home made strawberry ice cream for dessert. It was the perfect day to sit outside and enjoy all this delicious food. It was a really fun weekend, but I’ll be happy to have my husband home too.